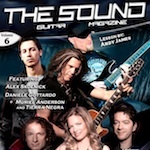 The Sound Guitar Magazine is one of the best online magazines for cutting edge guitar playing and is absolutely free to download from www.thesoundguitarmagazine.com. Packed full of transcriptions, interviews, special features and lessons from some of the best players in the world! Issue 6 features my masterclass in Legato playing, referencing the style of players such as Eddie Van Halen, Randy Rhoads, Joe Satriani and Steve Vai. The issue also features transcriptions and lessons from a host of top players and teachers including Alex Skolnick, Jason Macedo, Johnny Hiland, Derryl Gabel, Mike Campese and Daniele Gottardo. Amazing value for no money! Download it now! This entry was posted on Thursday, May 19th, 2011 at 11:36 pm	and is filed under News. You can leave a response, or trackback from your own site.